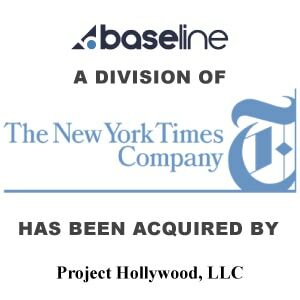 The New York Times Company Completes Sale of Baseline to Project Hollywood LLC - Berkery, Noyes & Co., LLC. The New York Times Company (NYSE: NYT) has sold its Baseline unit to Project Hollywood LLC, a privately held company which is majority owned by media and Internet entrepreneurs Laurie S. Silvers and Mitchell Rubenstein. Terms of the transaction were not disclosed. Baseline, based in Los Angeles, Calif., is a leading online subscription database and research service for information on the film and television industries, and a provider of premium film and television data to Web sites. The New York Times Company, a leading media company with 2010 revenues of $2.4 billion, includes The New York Times, the International Herald Tribune, The Boston Globe, 15 other daily newspapers and more than 50 Web sites, including NYTimes.com, BostonGlobe.com, Boston.com and About.com. The Company’s core purpose is to enhance society by creating, collecting and distributing high-quality news, information and entertainment. Project Hollywood LLC is majority owned by Laurie S. Silvers and Mitchell Rubenstein, who previously founded the SyFy Channel and MovieTickets.com. Ms. Silvers and Mr. Rubenstein currently own a variety of Internet properties including Hollywood.com, Spill.com, and Hollywood Wiretap.